The Troughton Recorder - ZineWiki - the history and culture of zines, independent media and the small press. The Troughton Recorder is a newsletter dedicated to Doctor Who, with a special focus on actor Patrick Troughton. The newsletter was founded by Annette Laing and Christy Keith, who published the first six issues. The first issue appeared in Spring/Summer of 1986 with two more issues following that year. Issue 4 appeared in Spring 1987, issue 5 in Fall 1987, and issue 6 in Spring 1988. 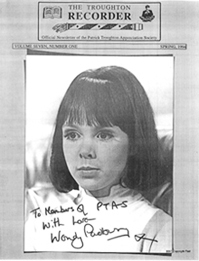 It was then taken over by Dean Shewring who released it from Peterborough, Ontario, Canada, until issue #21.
Letters came from Deborah Watling, and Michael Craze. The 21st issue, edited by John Sigerson, was released January/February 1993, and included contributions from Bob Furnell, Greg Fink, Kevan Hudson, Steve Parker, Dean Shewring, and John Sigerson. Other contributors during this period included writing by Marguerite McCurry, and art work by Sharon Ann Campbell, Cole Johnson, Martin Proctor and Sam Tweedle. Issue 24, published in Spring 1994, seems to be the last issue. Dean Shewring and John Sigerson were also editors of Cosmic Hobo. John Sigerson was also one of the editors of Enlightenment, and Dean Shewring was also editor of The Gallifrey Gazette. This page was last modified on 3 December 2017, at 14:28.